Back in the present, Angela’s teaching Jane how to make her patented Rizzoli ragout so she’ll be able to feed herself in D.C.
Notice how she said “man” and didn’t mention anything about a woman. I’m just saying. Speaking of women who are better than Angela’s ragout, Maura’s doing some apartment-hunting for Jane online. She’ll obviously be visiting D.C. all the time, so it’s only fair she gets to have a say, particularly when it comes to the bedroom. “Quality soundproofing” is no doubt on the checklist she’s putting together for Jane ahead of the big move, but between Angela’s cooking lessons and Maura’s organizing frenzy, Jane’s overwhelmed. She admits that while she wants to be excited, she’s sad about leaving her mom and her girlfriend behind. Pretty soon, the trio is teetering on the edge of an epic cry-fest. Just before the opening sequence begins (for the second-to-last time ever, in case you needed reminding), Jane heads to the fridge for wine. On the other side of that Irish jig we’ve come to know and love and occasionally couch-dance to, Jane and Maura find out that the murder of the week is personal for Korsak. Over at the crime scene, Korsak explains that the victim, Walter, was the father of Wendy, the girl in the opening of Rizzoli & Isles 7×12. “Hasn’t this family suffered enough?” he wonders aloud. After Maura performs Walter’s autopsy, Jane drops by to hear her findings and senses something’s off. Sure enough, Maura heard from a publisher about the mystery novel excerpt she submitted, and she’s having a hard time dealing with some of the feedback. Uh, Jane begs to differ (and I bet Angela would too, given the proximity of the guest house to Maura’s bedroom). Still, Maura’s lost her confidence, and she’s even considering giving up writing altogether. “Why, because you didn’t hit it out of the park on your first try?” Jane questions. “I’m wrong until I’m right on every murder we’ve got.” I kind of want that on a motivational poster. What’s more, Jane’s not done yet. “If you don’t believe in it, then who else will? Believe! 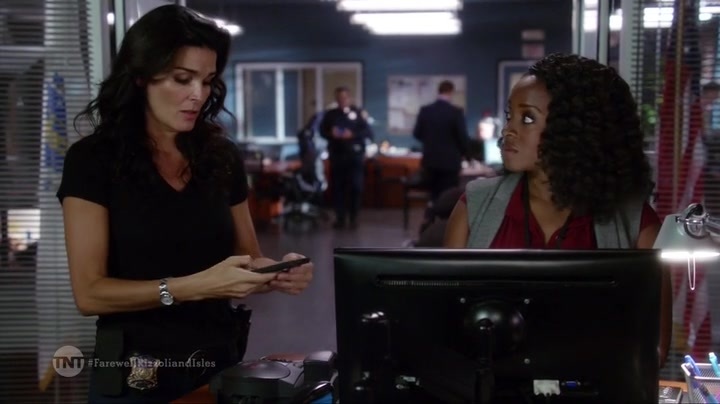 Believe, Maura!” she implores, making a dramatic exit that’s more Angie Harmon than Jane Rizzoli, but adorably hilarious nonetheless. Meanwhile, Nina’s research reveals that Walter volunteered for the Victim Advocacy Group, an organization that supports families affected by crime. It’s an honorable endeavor, but also one that put Walter in the crosshairs of people like the man who threatened him at a parole hearing the previous week. Seven minutes into the episode, though? He’s totally not the guy. Speaking of people who totally aren’t the guy – at least not for Jane – FBI Agent Davies from Rizzoli & Isles 7×07 shows up at the BPD unannounced and proceeds to ask Jane to dinner. “Like a professional colleagues’ dinner?” Jane clarifies. For the uninitiated, this is clearly code for I like girls and not you and also this is awkward. I won’t cover the dinner at length, but basically Davies says he likes Jane and Jane says relationships have never been her priority – except the one she has with the Chief Medical Examiner of the Commonwealth of Massachusetts, obviously. They proceed to compare how many times they’ve been shot, which opens up the opportunity for a throwback to the season 1 finale when Jane shot herself. They may or may not go back to Jane’s place after dinner but, like, whatever, I’m not here for that. Lest we forget there’s a crime to solve, Korsak finds himself in the unfortunate position of having to interview someone he knows. Mary – Wendy’s older sister – tells him that Walter never gave up on finding Wendy’s killer, even after all these years. Could that have been what ultimately got him killed? What he can do is tag along with Jane to visit Maura, who has news about the tests she ran in hopes of identifying Walter’s killer. “Please tell us you found some DNA, and I’ll…” Jane catches herself, remembers Korsak’s in the room, and finishes her sentence with, “give you a hundred bucks.” Of course, Maura did find something and Korsak declares no take-backs, so Jane’s efforts to keep things G-rated end up with a three-figure price tag attached. Turns out the DNA matches an unknown sample from a cold case – and not just any case. The person who killed Walter also killed Wendy four decades earlier. Jane orders background checks of the birthday party attendees, and the wealthy Davenport family that hosted the event come under suspicion. In between being given the runaround by the Davenports’ high-priced lawyer, Korsak and Jane talk about Jane’s impending move, and she admits her conflicted feelings. That includes the first time Jane kissed Maura, FYI. Jane and Korsak finally get an audience with one of the Davenport sons, Robert, who’s reluctant to let them speak to his father or brothers but insists the family has nothing to hide. Yeah, like Jane and Korsak have never heard that one before. Later, Jane and Frankie head to the father’s estate, which he just so happens to be in the process of selling. They’re stonewalled once again, but Jane gains entry to the house by going on an impromptu undercover mission as a moving company employee – and swiping some DNA while she’s at it. That’s… not legal, but there’s literally one episode of the show left, so nobody’s about to start following procedure now. Anyway, the father didn’t commit the crime, but his DNA is a familial match to the killer’s. Maura and Kent perform a state-of-the-art test that chillingly reveals a child’s handprint on the dress Wendy wore the day she died, and the fingerprints match Robert Davenport’s. When Robert tries to flee, Jane and Korsak apprehend him at a nearby airfield. As it should be, Korsak steps up to Mirandize Robert, and with that, the case that prompted him to become a cop is finally solved. Maura ruminates on the idea because that’s what Mauras do. Eventually, she decides to take a month-long trip to Paris, leaving the M.E.’s Office in Kent’s capable (OK, that’s questionable) hands. As Maura tells Jane about her decision, Agent Davies appears (uninvited, again). He cancels his plans with Jane because he “got called in on a case,” i.e. he sees Jane and Maura’s crazy chemistry but his stubborn man pride won’t let him concede defeat. After Davies exits stage left, Jane asks Maura on a date to the Dirty Robber. Naturally, Maura responds, “Oui.” I see some French-kissing in their future, but not until after Jane helps her mom at the Robber in exchange for weekly shipments of frozen ragout. With Rizzoli & Isles 7×12 entering its final minutes, it’s time to give Rizziday a little attention. The ever-enterprising Nina created a computer program to automatically enter holiday sweepstakes, so it looks like she and Frankie will be enjoying an Antiguan honeymoon – for free! There’s just one small problem: Nobody knows they’re engaged. Once Frankie presents Nina with a ring made from a Rizzoli family heirloom, they’re eager to tell everyone, but as they head back over to the table, Korsak totally steals their thunder. He has an announcement of his own: He’s retiring! Frankie and Nina agree to hold back on their news, and the other couple in attendance plays us out with some familiar yet bittersweet bickering. The series finale of Rizzoli & Isles airs next Monday at 9/8c on TNT, following an all-day season 7 marathon. If you’re looking to pregame, here’s my overview of the good, bad, and downright ugly parts of the past seven years.